Originating as a farm dog in Flanders, Belgium, the Bouvier Des Flandres temperament is loyal, intelligent, and familial. Above all, the Bouvier Des Flandres is a family dog. They adore humans and make great family dogs. Because of their past, the Bouvier Des Flandres may want to “herd” children with careful nudges or barks. If they are raised with children, though, they won’t have a strong urge to herd. The Bouvier Des Flandres is a friendly breed, but they will get along best with other dogs or pets when raised together. Their herding instinct is strong, though, so supervision around other animals is necessary. This is a strong-willed breed with a strong personality. They are not recommended for first-time dog owners as they do best with consistent leadership. The Bouvier Des Flandres protective nature makes them natural watchdogs. They will defend their family if necessary, but they are not aggressive without reason. Although they are not a small breed, the Bouvier Des Flandres can live quite comfortably in apartments or condos. But, they do require daily exercise. During the World Wars, Bouvier Des Flandres breed worked as a service dog as well as a messenger, sentry, and a search and rescue dog. 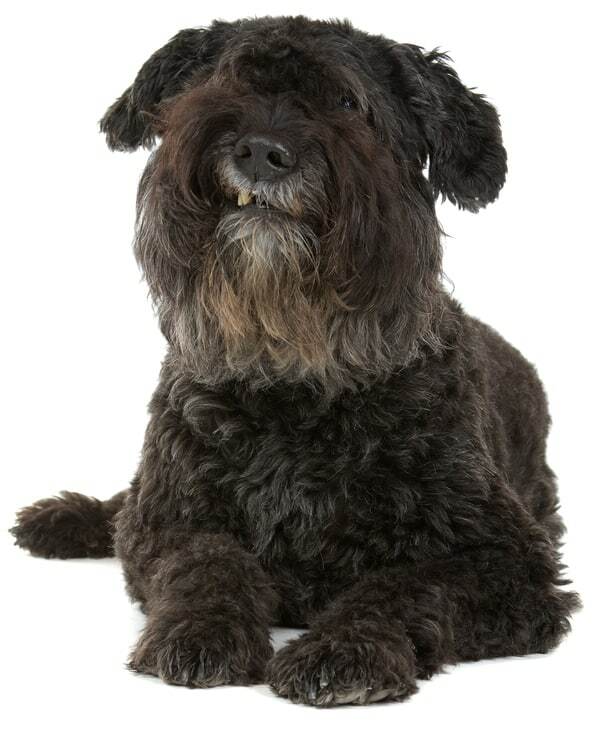 The Bouvier Des Flandres dog is intelligent and learns quickly. However, they do have a mind of their own and need an even smarter, patient human to train them. They are happiest when they have a job to do – whether that means herding, obedience, “babysitting”, guarding, or even rescue work. Bouvier Des Flandres’s thrive on praise and are eager to please. When they know what you want, they’ll do everything they can to make you happy. But once they learn a command, they want to try something new – even becoming stubborn if you attempt to repeat a command too many times. 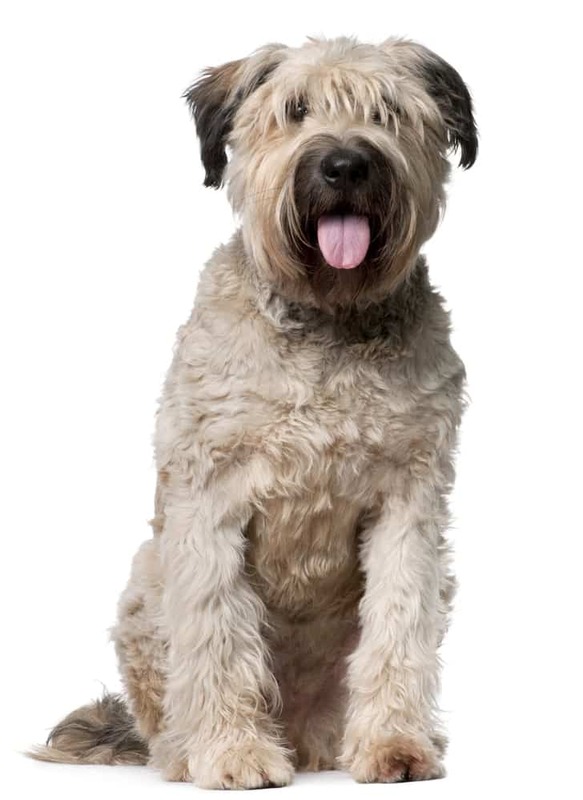 For help with training the Bouvier Des Flandres, check-out The Online Dog Trainer. Ready to add a Bouvier Des Flandres to your family? Now it’s time to decide whether you’d like a Bouvier Des Flandres for sale from a breeder or one from a rescue organization. 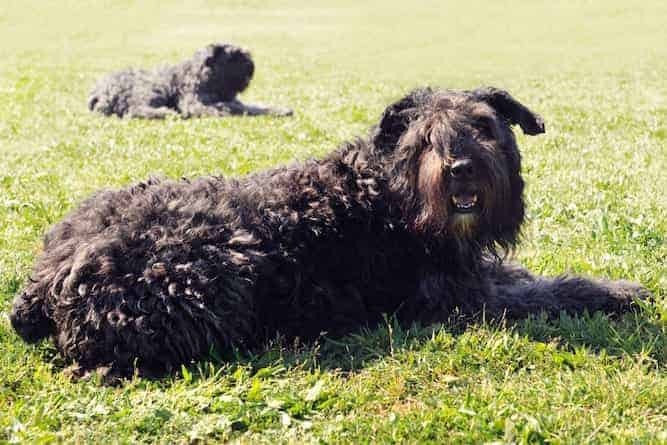 A great place to start your search is the American Bouvier Des Flandres Club. They have information about the breed as well as breeder and rescue resources. Bouvier Des Flandres puppies for sale will cost between $1,200 to $6,400. The typical/average Bouvier Des Flandres cost is closer to $1,200. The Bouvier Des Flandres price depends on several factors including breed line, litter availability, and location. If you’re looking for a top pedigree Bouvier Des Flandres, expect to pay closer to $6,400. If you’ve decided on Bouvier Des Flandres adoption, the American Bouvier Rescue League is a great place to start. They have information about the breed as well as Bouvier Des Flandres available for adoption. Bouvier Des Flandres rescue is the perfect option for families looking for an adult dog or even a Bouvier Des Flandres mix. Adult dogs are often already trained and are much less rambunctious than puppies! Rather go the Bouvier Des Flandres breeder route? To find Bouvier Des Flandres puppies, check out the AKC Marketplace. You can search based on breeder distinction, whether they are of champion bloodline, and if puppies are available now or coming soon. 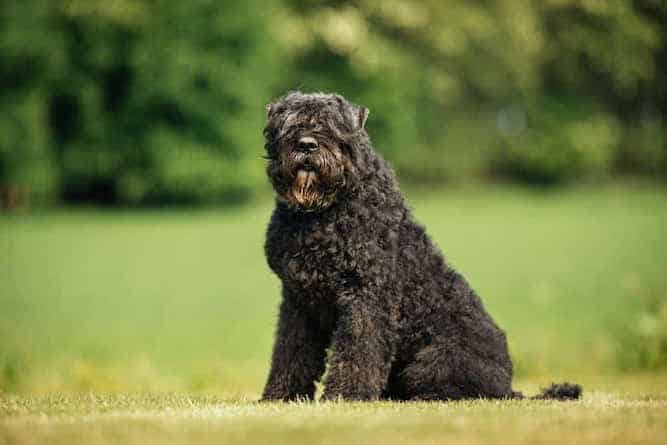 When choosing a Bouvier Des Flandres breeder, make sure they can provide health certificates, answer questions about the breed, and their kennel space is well-kept. 23.5 – 26.5 inches for females. You can expect your Bouvier Des Flandres to live between 10-12 years. Bouvier Des Flandres grooming is not as difficult as it appears. They have a weather-resistant double coat. Their outer coat is long and coarse while their undercoat is dense and fine. They come in several colors such as black, fawn, salt and pepper, and brindle. Bouvier Des Flandres have a Dutch nickname, “Vuilbaard”, which means “dirty beard.” They get dirty fairly easily; expect muddy paws, burrs, leaves, and a dirty, wed beard. Some owners prefer their Bouvier Des Flandres shaved because they get dirty so easily. The Bouvier Des Flandres shedding is not excessive, but they do need a brushing two-three times per week. Check their fur for any ticks, burrs, or weeds regularly and bathe them every six to eight weeks. 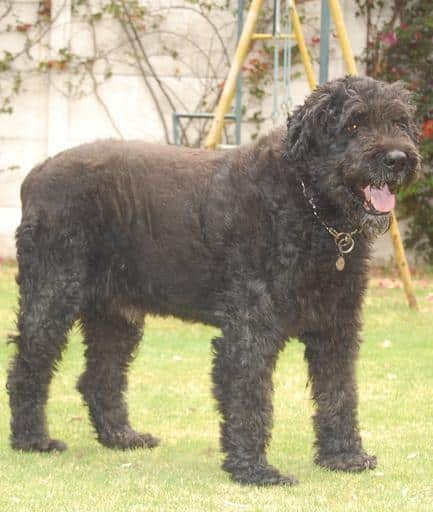 The Bouvier Des Flandres is prone to several health conditions such as hip dysplasia, elbow dysplasia, cataracts, cancer, hypothyroidism (a thyroid disorder), epilepsy, bloat (also known as gastric torsion), and Cushing’s disease (when the body produces too much cortisol). Note: If you agree that your health and your dog's health should be a top priority then get a copy of The Ultimate Guide to Dog Health. Your dog will love you for it. The Bouvier Des Flandres is a moderate to high energy breed. They love to stay busy and are perfect for an active household. Take your Bouvier Des Flandres on daily walks, jogs, or even bike rides to tire them out. A bored Bouvier Des Flandres can be a destructive one. Make sure they receive enough physical exercise and mental stimulation, or your house will suffer. Conclusion: Why a Bouvier Des Flandres? The Bouvier Des Flandres is a strong-willed dog with an immense love for their family. This is a moderately active breed that lives for a job. They do well with active families who will take them on long walks or bike rides. The Bouvier Des Flandres is intelligent and will respond well to training, but they do have a mind of their own. Use consistency and positive reinforcement training. If you are looking for an even-tempered, courageous dog that adores their human companions, the Bouvier Des Flandres is the perfect match. Next post: American English Coonhound Temperament (Energetic, Active): Is Your Personality and Lifestyle A Great Match?